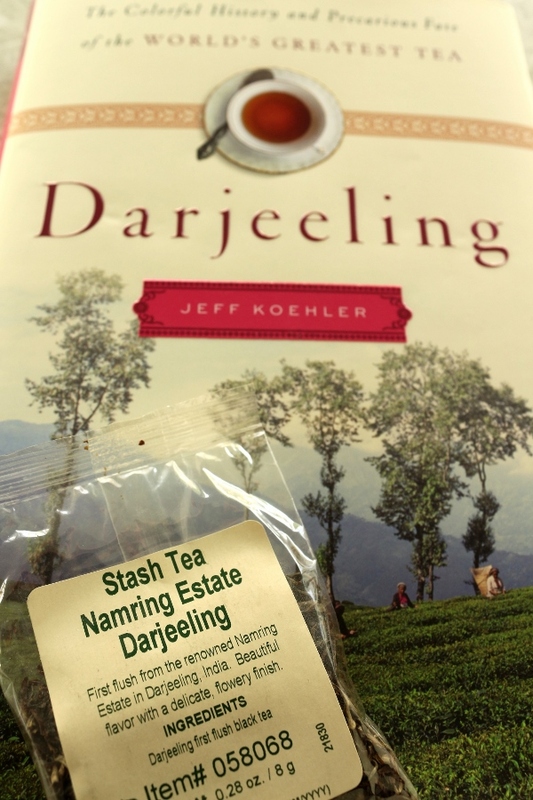 From the first pages to the very last of his most recent book, Darjeeling, Jeff Koehler paints a very colorful history of what is considered to be "World's Greatest Tea." This is not a cookbook (although it does contain about two dozen recipes) but rather a vivid look at the Darjeeling region of India from colonial times to present day. 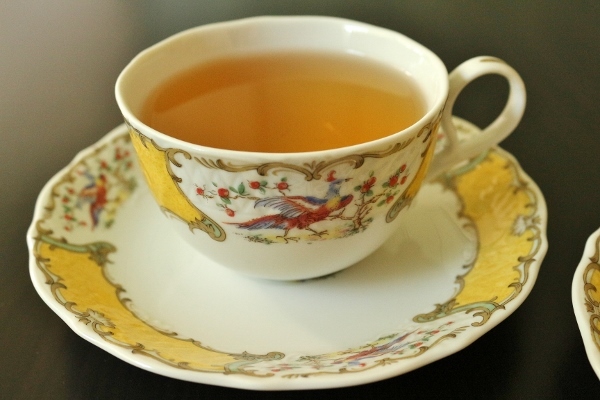 Sordid tales of how tea bushes were smuggled from China, battles for foreign trade (including opium wars), and more are shared in striking detail. 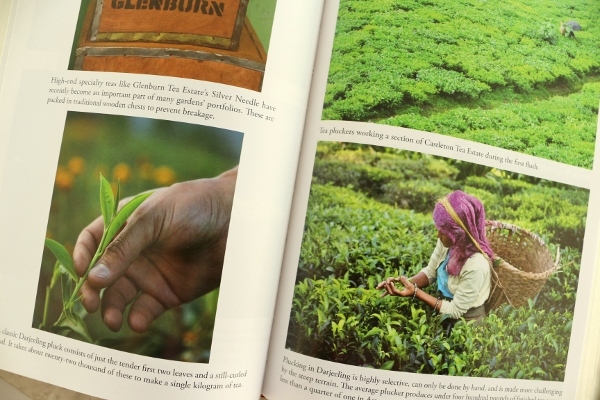 My favorite parts of the book actually discuss the dynamic terroir of the Darjeeling tea gardens, as well as the entire process from picking the leaves to selling the finished teas at auction. Apparently, pickers and sorters of Darjeeling tea are always women, since their hands are more delicate. Sadly, they also get paid next to nothing, leading to the big question as to the future of Darjeeling tea. 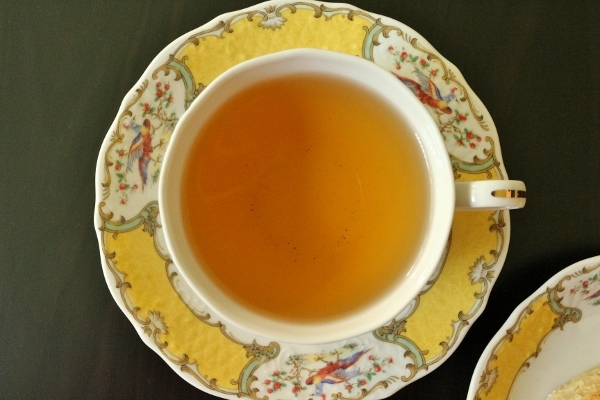 Darjeeling is known for its single-estate teas, unblended and unflavored. With characteristic brightness frequently likened to newly minted coins, fragrant aromas, and sophisticated, complex flavors--delicate, even flowery (more stem than petal, as one expert blender put it), with hints of apricots and peaches, muscat grapes, and toasty nuts--it's the world's premium tea, the "champagne of tea." 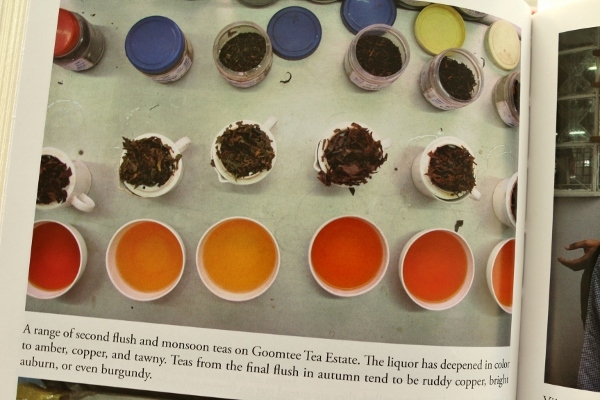 There are many qualities that make Darjeeling tea so unique, including the four different flushes, or seasons of tea, each showcasing very particular traits. I won't really go into specifics (definitely read the book for a detailed look) but I'm surely more knowledgeable after taking a look at this fascinating tea region through Koehler's words. 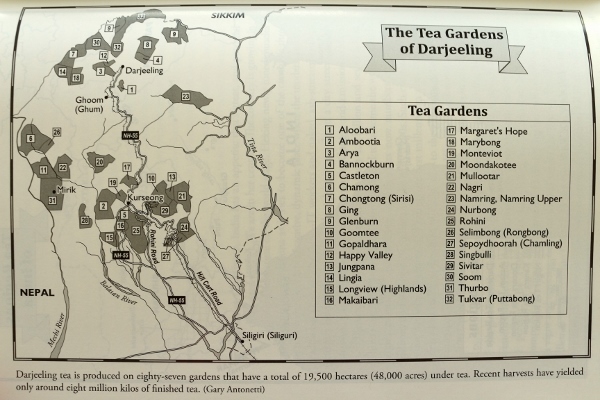 If you're a tea-lover like I am, or an avid reader who enjoys learning more about where your food (or in this case drink) comes from, pick up a copy of Darjeeling: The Colorful History and Precarious Fate of the World's Greatest Tea. After learning everything you could hope to know about the Darjeeling tea industry, you can even whip up some really appetizing recipes. 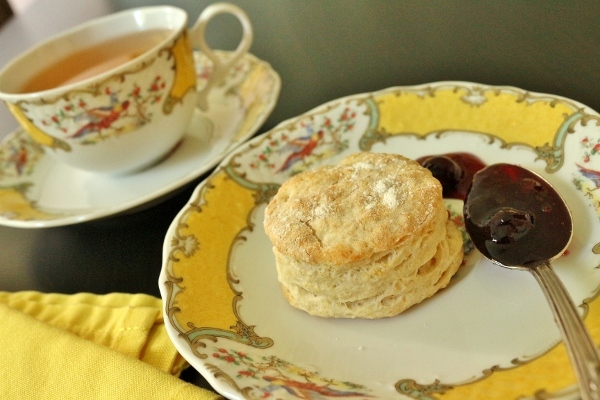 There's probably nothing more perfect to accompany a cup of the World's Greatest Tea than a flaky, delicate scone hailing from the Ritz of London. Second to that is a flaky, delicate scone from my own kitchen, but using the recipe from the Ritz of London. It's much cheaper than flying to England! 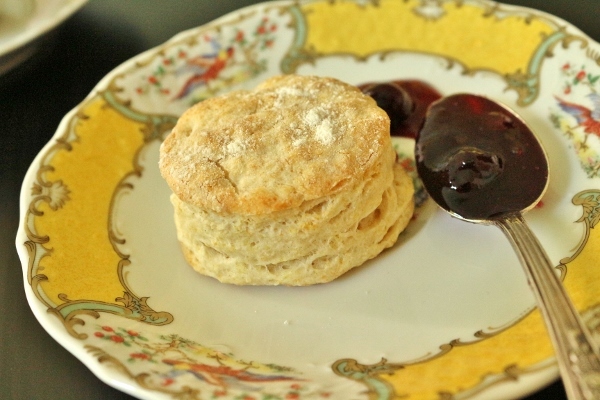 The scones themselves remind me more of American biscuits than what I consider to be scones. 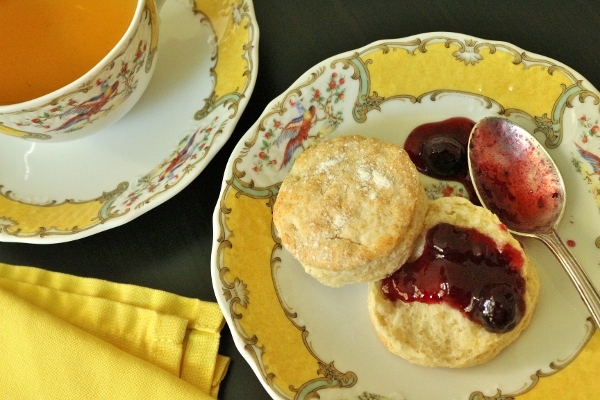 I know true British scones aren't as sweet as they are across the pond in America, but this recipe contains no sugar at all. 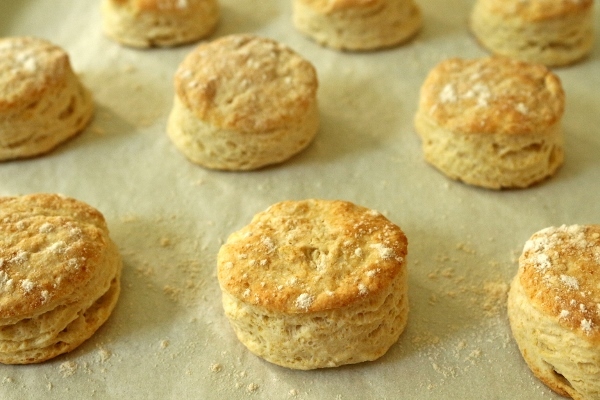 Even American biscuits often contain a touch of sugar. With that said, they are still delightful and very light and flaky. 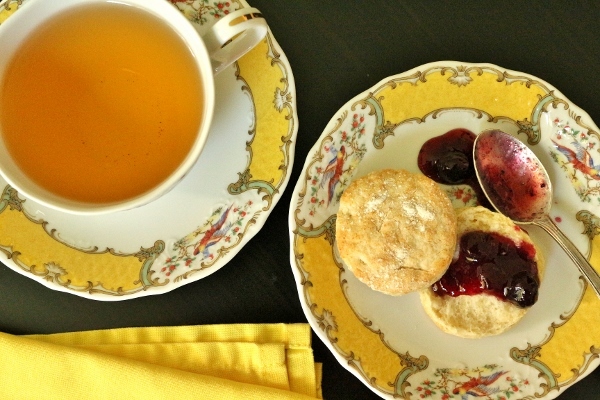 You can enjoy them simply as they are (the delicate flavor won't overwhelm your tea as much) or add a spoonful of jam and/or clotted cream to dress them up a bit. The recipe doesn't say anything about rolling out your scraps of dough after cutting out circles, and many bakers will say not to because the re-rolled dough doesn't get the same air that the first batch does, but I hate being wasteful so I always re-roll my scraps at least once to punch out a few more biscuits or scones. In my first round of cutting using a 2 1/4-inch cutter, I ended up with 10 scones, but managed to get a total of 15 by using all of the scraps (even the last couple of ugly ones still taste good even if they aren't as pretty). 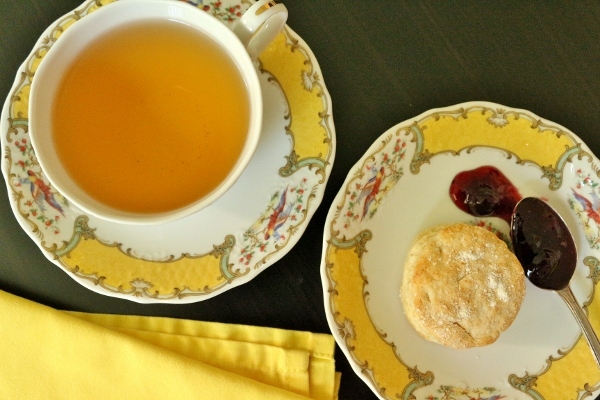 Side note: The teacup and saucers photographed here are from the Newport Mansions Store. The Chelsea Bird design is a replica of one found in Kingscote, one of the Newport Mansions. The original antique porcelain it is based on dates back to 19th century Chelsea England, a center for the manufacture of fine porcelain at the time. Pretty cool, huh? Sift the flour into a large mixing bowl. Add the baking powder, cream of tartar, baking soda, and salt. Work in the butter with the fingertips until the mixture has the consistency of large, flaky crumbs. Stir in the milk using a spatula until the dough is soft. On a floured surface, roll out the dough to a 1/2-inch (1.25 cm) thickness. 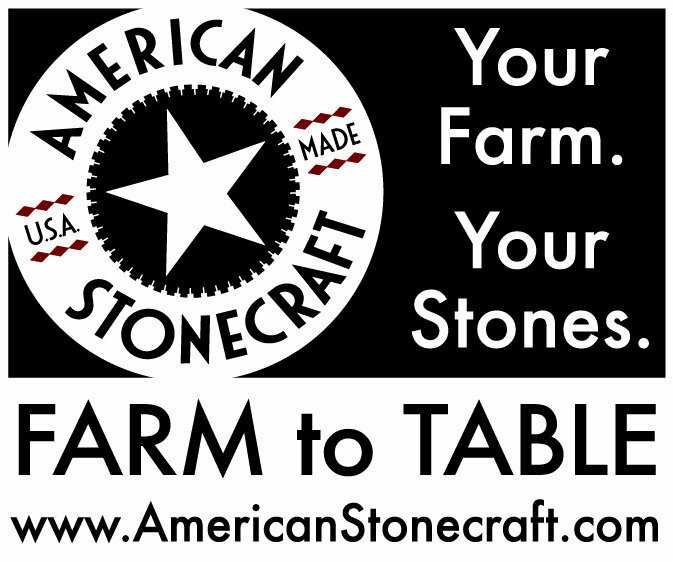 Use a pastry cutter 2 to 2 1/2 inches (5 to 6.5 cm) in diameter or a water glass, press out rounds. 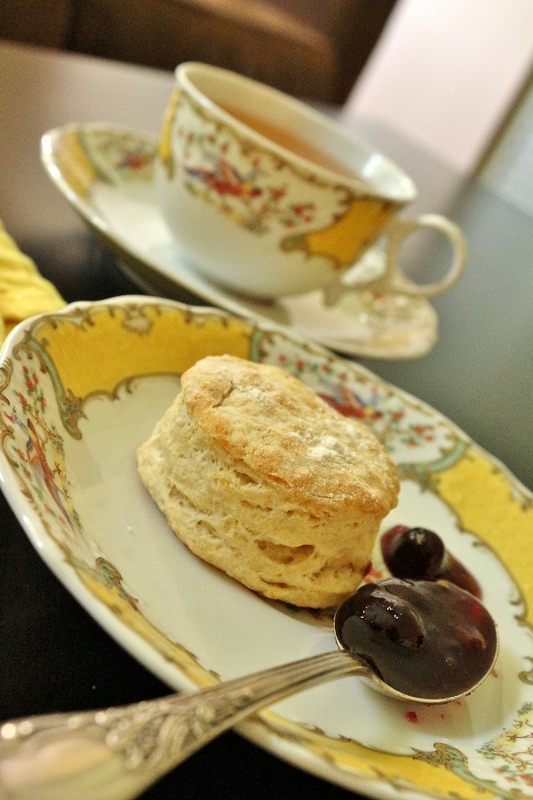 (Do not twist when pressing out, or the scones are likely to bake unevenly). Lightly grease a baking sheet with butter (I lined it with parchment paper instead). Arrange the rounds on the sheet. Lightly dust their faces with flour. Bake until they have risen and turned golden, 10 to 15 minutes. Remove from the oven. Serve warm.